Yes stupider is a word. Don’t believe me? Look it up. 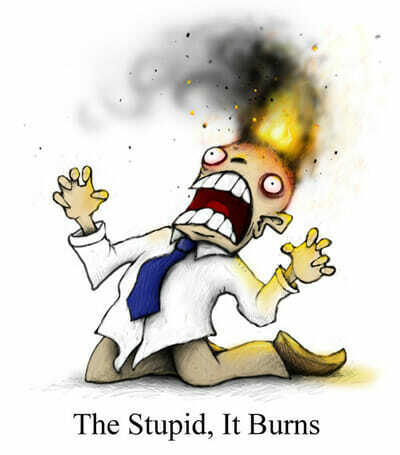 Lately global warming deniers have been really scraping the bottom of the barrel with their arguments. Sadly none of this is an April fools joke. First up to bat is William Happer who argues that really the earth is in a CO2 famine because 80 million years ago there was more CO2 in the atmosphere. Yes you heard that right. Of course what Happer doesn’t mention [I wonder why?] 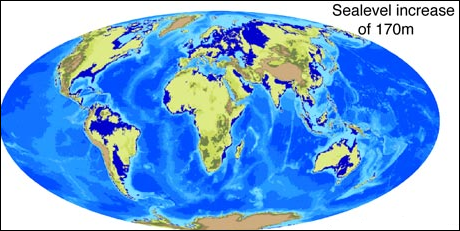 is that 80 million years ago sea levels were roughly 170 meters higher than they are today. What does a sea level rise of 170 meters look like? The dark blue areas represent the flooded areas. And yes many of those areas are very densely populated. But don’t worry I am sure the hundreds of millions (billions?) of people living in coastal areas wont mind a living underwater. Of course that doesn’t even begin to tackle the fact that the many ecological reasons why Happer’s argument is absurd. Next up is David Bellamy, who openly states that “peer-reviewed journals – it’s the last thing I would use now.” In one fell swoop he completely dismisses the entire scientific establishment. But if he wont trust peer-reviewed journals who will he trust? I humbly suggest he trust me, and my writings here on this blog; he could do a lot worse. Of course Bellamy also used a non-existent data set, embraced the claims of unqualified cranks, ignored an entire canon of science and relied on fraudulent data. But if that is not enough, he also thinks that the last ice age ended 150 years ago. In actual fact it ended roughly 10,000 to 15,000 years ago. I believe that Earth’s climate is changing, but I think it’s changing for natural variation reasons. And I think man-kind has been adopting, or adapting, to climate as long as man has walked the Earth. When it rains we find shelter. When it’s hot, we get shade. When it’s cold, we find a warm place to stay. Adaptation is the practical, affordable, utterly natural reflex response to nature when the planet is heating or cooling, as it always is… Adaptation to shifts in temperature is not that difficult. Brilliant! But that is not all, he also cited the work of the potty-peer himself: Lord Monckton. And what is Monckton’s expertise in the are of climate science? Absolutely none. And I thought it was absurd when Michael Crichton testified to the US senate. At least he has a science background. Monckton’s education is in journalism. The earth will end only when God declares it’s time to be over. A man will not destroy this earth. This earth will not be destroyed by a flood. And I appreciate having panelists here who are men of faith and we can get into the theological discourse of that position. But I do believe that God’s word is infallible, unchanging, perfect. Two other issues Mr. Chairman. Today, we have about 388 parts per million in the atmosphere, I think in the age of the dinosaurs, where we had the most flora and fauna, we were probably at 4,000 parts per million. There is a theological debate [???] that this is a carbon-starved planet, not too much carbon. Got that? Don’t worry about about the increase of sea levels due to the massive increase, because God promised not to destroy us with a flood. I imagine that is small comfort to the people of Fargo, who just witnessed the second hundred-year flood in the past 12 years. Ah yes, the whole CO2 famine argument; Happer’s claims are already starting to echo. But Monckon’s example is even worse than Happer’s. Monckton cites the Cambrian period, which ended 480 million years ago! Of course it should be obvious that things have changed considerably since then, perhaps most drastically here on land, where there now exists a diverse and abundant community of flora, while during the Cambrian period there were no land plants. 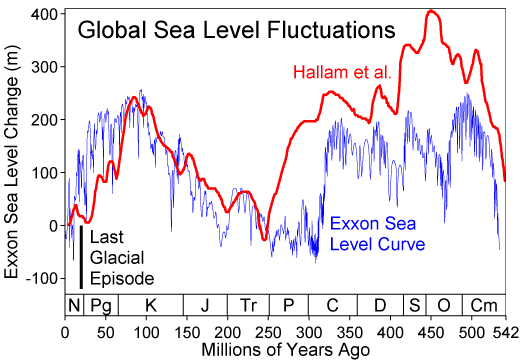 Oh and sea levels were 30 to 90 meters higher than they are today. Not exactly a comforting reference at a hearing about the possible impacts of climate change. Given that it is absurd that Monckton and Shimkus next go on and state that CO2 is plant food (CO2: they call it pollution; we call it life). Of course while CO2 may have some beneficial properties for some plants, the situation is ultimately anything but certain. Or in short ‘Too much of a good thing is a bad thing’. But for those of you still worried, relax. No one wants to remove all the CO2 from the atmosphere, at most all we want is to return CO2 to levels comparable to those that have existed for that past several thousand years; there will still be more than enough CO2 for plants. The concern with global warming is change that will cause economic disruption and environmental disturbances and damage to places we like…like cities. Honestly, if nations collapse, we know that algae will still thrive. We just happen to generally take the side of humanity. All of these denier arguments are exceedingly poor, more so than the usual dreck coming from deniers. None of these arguments would seem out of place in an April fools joke. Yet all of these arguments are real, and being made in the US Congress. This is absolutely absurd, and anyone who takes these jokers seriously is an idiot. That much is abundantly clear. Everyone please point and laugh at the idiot. 10-year-old farmkids learn Liebig’s law of the Minimum, which explains perfectly well why extra CO2 helps plants grow in greenhouses (with plenty of water,sun, and nutrients, conditions that do *not* apply in most agriculture.) Some plants in fields do respond, but the effect asymptotes, depending on the crop. Among the best CO2-loving plants are poison ivy & kudzu. But, all of this old stuff being recycled again. See Naomi Oreskes’ April 2008 talk You CAN argue with the facts, with my synopsis. That Western Fuels Association campaign is where a lot of this starved-for CO2 junk seems to have started. Thanks for the link to that presentation by Oreskes, it was quite interesting, and I recommend everyone watch it. I truly enjoyed when she showed the scene from the movie produced by the Western Fuels Association that shows how more CO2 will result in the greening of the Sahara (29:20 in the movie). That made me laugh. No amount of extra CO2 will let you grow corn in the Sahara desert. Any rebuttals for this? I’m not expert, but I have to say that this guy seems persuasive to me, like he’s certainly done his homework. I certainly don’t think you can call him stupid…. I’ve read a few things written by Glassman and I can assure you that he hasn’t done his homework. For example he claims that the increase in CO2 is a result of warming and not due to our burring of fossil fuels, despite the massive evidence to the contrary. Anyways on to the claims he makes at the link you provided. He spends a great deal of time indicating areas where the models make assumptions that do not match up exactly with reality, but virtually no time explaining what that means. We already know that models are simplified versions of reality, so this isn’t a particularly insightful revelation. You are, however, right that Glassman’s writings aren’t as laughably stupid as what I describe above, however they are still wrong. But the real question, for non-experts is why would I trust an applied physicist and engineer’s internet writings over the published peer-reviewed research by climatologists. My primary purpose in presenting all of this is simply to stimulate debate. So not even Roy Spencer is drawing any firm conclusions from what he wrote so neither should you. Attribution of the CO2 increase was also discussed in the comments of this post. It’s just nature Scruffy ! Oh no! not the CO2 doesn’t lead it lags denier talking point!!! That settles it AGW is bunk! Please read the comment policy (and the links provided there), as I am tired of debunking the same claims over an over again. If you wish to challenge the consensus view then the least you could do (if you want to maintain some credibility) is understand the science and learn what the consensus view actually is. Repeating fully debunked talking points makes you sound foolish.